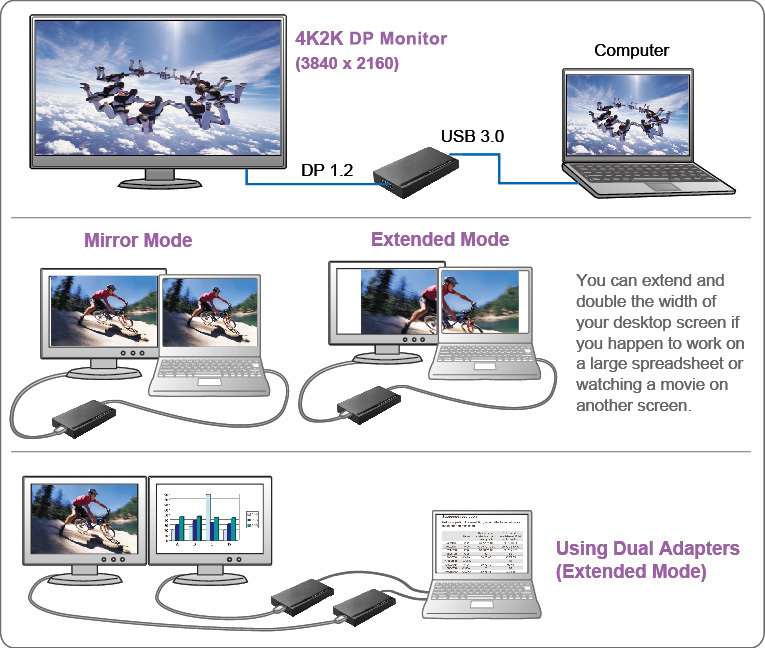 The USB 3.0 to 4K DisplayPort Adapter is a device which enables connection to 4K Ultra HD display device to a computer using USB 3.0 port. It will make your legacy PC with old graphics card to support 4K resolution easily. Besides, with this convenient design, it can connect up to 6 display devices to a computer without installing extra video cards. Once the driver has been installed, the USB-attached monitor will be enabled immediately without any rebooting process of operating system after plugging the USB adapter. System performance is an important issue when using multiple monitors. Another benefit of this adapter is that it occupies little computer resource; ensuring users get quality display without comprising computer performance. Power Consumption Operating Mode: 370mA approx.